Wade Boggs was among the game's best pure hitters during the 1980s and 1990s, played for two of the biggest franchises in the sporting world and surpassed one of baseball's most sacred benchmarks of 3,000 career hits. 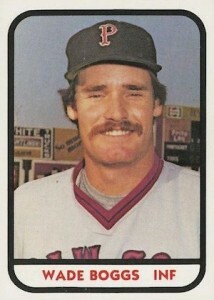 This top list looks at ten of best Wade Boggs baseball cards for collectors of all budgets. Shop for Wade Boggs Autograph Cards on eBay. 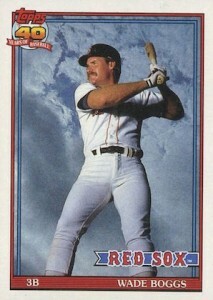 Boggs broke into the MLB in 1982 with the Red Sox. Over the course of his career in Boston, the dynamic hitter notched all five of his batting titles, including four straight from 1985 to 1988. He also made nine All-Star games and helped the Red Sox win the 1986 American League pennant. Although Boggs left the Red Sox in 1993 to play for their chief rivals, the New York Yankees, he departed Boston holding the all-time highest batting average in the history of Fenway Park. His .369 average at Fenway puts him above other notable Hall of Famers from the team like Ted Williams and Carl Yastrzemski. After joining the Yankees in 1993, Boggs continued to be one of the game's best contact hitters, bating over .300 four times while playing for the Bronx Bombers. His greatest accomplishment with the Yankees came in 1996 when he helped the team win their first World Series title since 1978. Boggs, a native of Tampa, Florida, spent his final two seasons playing for his hometown Devil Rays, recording his 3,000 hit during the 1999 season. He was elected to the Baseball Hall of Fame in 2005 on his first ballot. Boggs' earliest appearance on MLB baseball cards came in 1983 with cards in all three major sets: Donruss, Fleer, and Topps. The three Boggs rookies are some of the most popular 1980s cards for collectors. His rookie cards appeared alongside Tony Gwynn and Ryne Sandberg in all three products, which helped drive the popularity of these three sets. Spending significant time in both Boston and New York endeared him with collectors and has made him one of the more popular modern players with card enthusiasts. 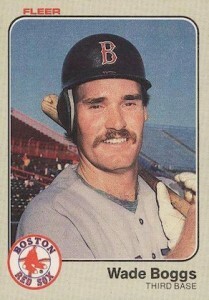 Wade Boggs remained prominent within the baseball card hobby throughout his career. Card companies frequently featured the third baseman not only in their base sets, but also gave him a place in their high-end products, inserts, memorabilia, and autograph sets. Even today, Boggs still frequently appears in modern baseball products. This top ten list looks at some of the best cards of Wade Boggs. His notable cards span throughout his career and show that there are numerous choices available to collectors looking to add cards of this all-time great to their collection. Click on the card titles or images to shop for specific cards on eBay. The 1991 Topps Wade Boggs base card is one of his most popular and affordable options for collectors. Marking the 40th anniversary for the card giant, 1991 Topps put an emphasis on photography. 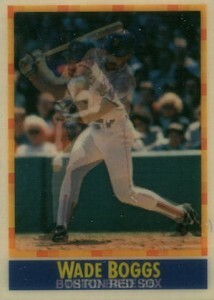 The Wade Boggs card delivers with a skyward-looking shot, setting the Red Sox great against a background of clouds. Collectors can also try to track down the Tiffany version of this card, with a high-gloss finish, or the Desert Shield version, which features a small gold logo in the top right hand corner. Both carry a premium over the base. Issued across several products, the Fleer Club 3000 memorabilia set featured some of the greatest players to reach either 3,000 hits or 3,000 strikeouts. The checklist is quite strong and features fourteen different Hall of Famers, including Nolan Ryan, Cal Ripken, and Stan Musial. 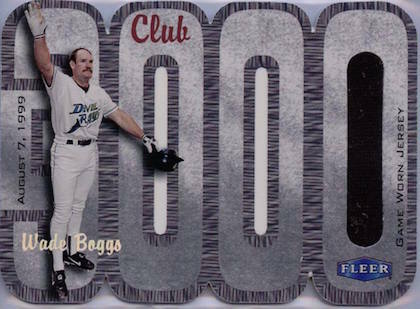 Boggs was the newest member of the 3,000-hit club in 2000, making this card one of the first to recognize him for reaching the benchmark. The memorabilia cards were inserted into Fleer Ultra and there are several different versions of this card ranging from his jersey card — the most common at 440 copies — all the way down to a bat/hat/jersey card that has just 25 copies. In 1993, Wade Boggs signed with the New York Yankees after spending the previous 11 seasons with the Boston Red Sox. 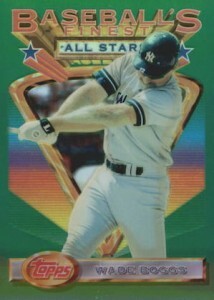 While some of the early releases in 1993 still had Boggs in a Red Sox uniform, as the summer continued, more and more cards featured Boggs with the Yankees. This includes one of the most important, and groundbreaking, sets of the 1990s. 1993 Finest set was Topps' first venture into the world of high-end cards and the standout of the set, Refractor parallels, have remained extremely popular with collectors. These limited cards can be tough to find and expensive to purchase. Wade Boggs rookies cards are still very popular with baseball collectors. The 1983 Donruss Boggs rookie is the easiest to find and the most affordable. Highly graded copies of this Donruss rookie are popular, but lag behind his other two rookies in terms of popularity. Promotional cards are often popular with collectors tracking down cards of a specific player. As promos, these cards are often only given to vendors or card shop owners. While they can a little tricky to find, most are not really all that rare. However, there are a few exceptions, including some of the promotional cards of the Sportflics sets offered by their Dallas-based parent company, Optigraphics. The promotional cards were highlighted by a Nolan Ryan autograph, but the other cards in the set are also very popular, including the Wade Boggs. 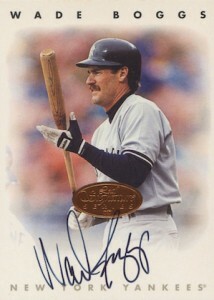 The first certified autograph of Wade Boggs appeared in the landmark 1996 Leaf Signature set. His autograph was amongst the short printed cards in the set, meaning that there are only 1,000 copies of his cards versus 5,000 for the regular print run. While card companies have produced other autographs of Boggs highlighting his time in New York, this card is a favorite with fans of The Pinstripes. 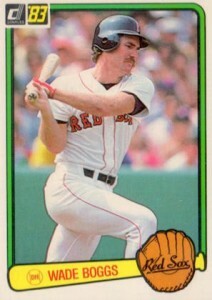 The 1983 Fleer Wade Boggs rookie card features a clean design and has remained a cardboard classic from the 1980s. The portrait-style card is one of the more affordable Hall of Fame rookie cards from this era. Even graded copies of this card are plentiful and can also be found for a reasonable amount. 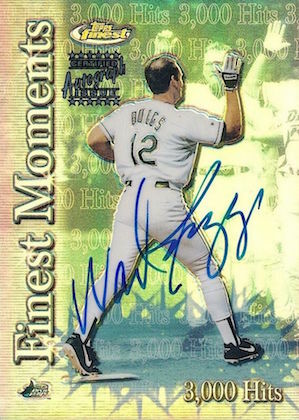 One of the most popular certified autographs of Wade Boggs is this 2000 Topps Finest card commemorating his 3,000th hit. The autographs are not serial numbered, so the exact quantity of the cards is not known, but Topps seeded these cards in packs at the rate of 1:425 packs, making them an extremely tough pull. The three rookie cards of Wade Boggs get a lot of attention, but he also has several minor league cards that collectors can track down. While many of the early 1980s minor league sets produced by TCMA were noted for their bright colorful borders, the 1981 set had a simple look with the white borders and portrait-style photographs. The Boggs card in this set is joined by early issues of fellow Cooperstown inductees Cal Ripken and Ryne Sandberg. 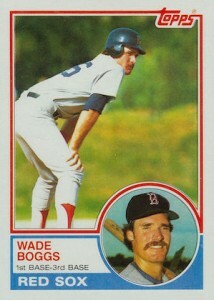 The 1983 Topps Wade Boggs rookie card has always been the preferred choice of his the three rookies with collectors. Both raw and graded copies of this card are consistently more sought-after than both his Donruss and Fleer. Much of the popularity can be attributed to the fact that the design and layout of this set has long been considered superior to both of the other major card sets from the year. This is a must-have with collectors of Wade Boggs, but also a great addition to other collections as well. Eric Bracke opened his first pack of cards during the summer of 1983 and has not stopped since, dabbling along the way in a few other sports. His writing career started in 2012 when he started The Snorting Bull Baseball Card Blog. WADE BOGGS 2016 IMMACULATE "IMMACULATE MARKS" BOSTON RED SOX AUTOGRAPH AUTO 49!